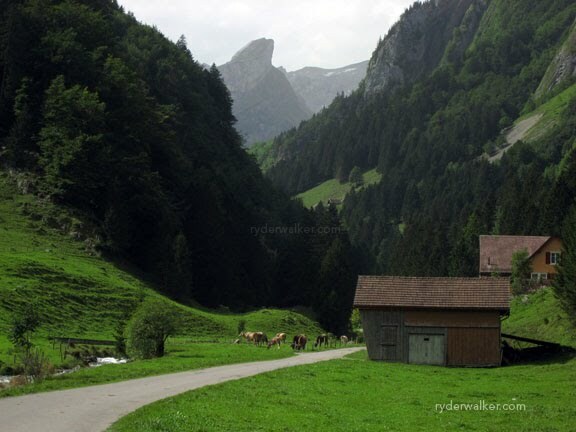 That’s what a friend recently exclaimed about Appenzell. We concur. There’s nothing boring about the juxtaposition of vertiginous limestone spires and the gentle Swiss countryside that surrounds them. Known as the Alpstein Massif, Appenzell’s folded mountain landscape juts out of gently rolling eastern Switzerland the way a solitary volcano thrusts skyward from the sea. Over millennia, rainwater eroded the limestone peaks of this range and produced an intricately sculpted maze that beckons hikers to get lost for a while. Precipitous drops, tenuous holds and airy trails that excite the acrophobe are just a few of the rewards for the intrepid adventurer that explores this mysterious land. Albert Heim, a geologist from the turn of the 20th century, once wrote that the Alpstein was perhaps, “the most beautiful mountain range in the world.” Indeed, a hiking tour through the Appenzell region must have sounded fun to him too.